The whole of the energy market has its eyes on oil and the drama surrounding it. Which means none of them are looking in quite the right place. Between 2005 and 2015, with increased use of hydraulic fracturing techniques, natural gas production levels grew from nearly 19 trillion cubic feet to over 28 trillion according to the Energy Information Administration. Oil production took off as well, reaching well above 9 million barrels per day. Then, in December of 2014, the Organization of Petroleum Exporting Countries (OPEC) decided to continue producing oil at record highs, rather than cutting production to prop up falling oil and gas prices as it had done before. The idea was to starve out shale producers, whose break-even costs were still relatively high, and force them to reduce production. As a result, both commodities plummeted. A global glut flooded the market with supply, and brought prices down to unmanageable lows. In the span of a year, oil dropped from $114 per barrel to $28, and natural gas dropped from $5.20 per thousand cubic feet to just $1.59. For two years, U.S. shale drillers suffered major losses. Cutting costs became key to staying afloat. In the end, OPEC blinked first; several of its members, including its leader Saudi Arabia, had their economies tied too tightly to oil, and found that they couldn’t afford to keep flooding the market. In January 2017, members and non-members alike agreed to cut production to bolster prices. Probably the most damaging result of the two-year rout on U.S. drillers was the massive reduction in exploration and production spending. As companies scrambled to cut costs where they could, new well drilling fell to the wayside. Not all shale plays are created equal. Some have features that allowed for cheaper, more productive drilling anyway. In the case of natural gas, this was true in the Marcellus shale play, which runs through parts of New York, Pennsylvania, West Virginia, and Ohio. The vast majority of the production from this play comes from Pennsylvania, where drillers have been able to tap into the ample natural gas supplies for years. Much like the Permian in the oil market, the Marcellus play has continued to be one of the most productive resources throughout the rout — though the Permian is also a major natural gas resource. 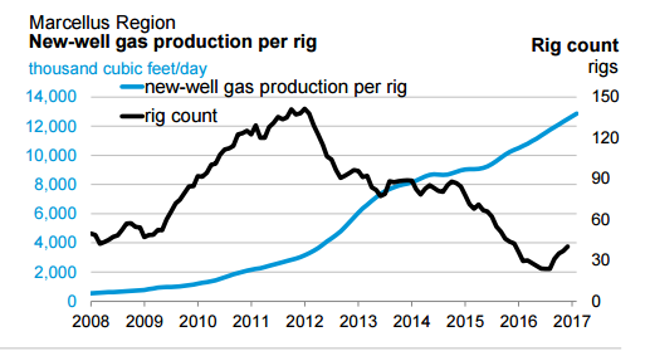 Even as less rigs were drilling less wells in the area, production per well continued to climb. Producers perfected new shale techniques that brought the cost per well down by millions of dollars while continuing to increase the value of each well. And there’s one last thing the two-year rout did for natural gas: it made it cheaper than ever. As a source of energy, natural gas has been gaining in popularity for years. Its biggest benefit as the world moves into clean energy mode is that it emits only a fraction of the greenhouse gases of traditional coal. The only thing holding it back before was the higher price, which made it harder for energy companies to make the switch. The shale boom made quick work of that barrier. In 2015, natural gas surpassed coal as the biggest source of energy in the U.S. And that was just the beginning. Worldwide, natural gas is replacing more traditional baseload energy production methods. In India and China, it’s seen as the best alternative to the coal capacity that has become deadly with building levels of smog. In Japan, natural gas has been used to replace nuclear capacity lost after the 2011 Fukushima disaster. Meanwhile, the list of countries shifting to natural gas as a way to support the move to full renewable energy is long, and growing every day! In 2016, the U.S. lifted the bans on both oil and gas exports that had been in place for more than 40 years, and the decision couldn’t have come at a better time. Right now, the only port that’s sending out regular LNG supplies is the Sabine Pass terminal in Texas, but several more are on the way. Most of the terminals are being built in Texas, well within reach of the productive Permian and Eagle Ford shale plays. One terminal, currently under construction in the Massachusetts bay, may have an advantage over even these large-scale shale plays because of its proximity to the Marcellus. As you saw above, it’s a valuable place to be for producers of natural gas. Natural gas demand is climbing worldwide, but a supply squeeze may be on the way. The price of the commodity was actually on its way back up before OPEC’s oil production cut boosted both fuels back upward. But the natural gas market didn’t emerge from the rout unscathed. Gas-heavy formations lost their fair share of rigs, and companies also cut spending on exploration. So when the glut balances out in full, someone’s going to come up short. And that means we’re going to see gas prices heading higher very soon. The companies that will reap the biggest rewards from this won’t just be natural gas companies, but producers with advantageous positions and the money to pick exploration and production back up off the floor. 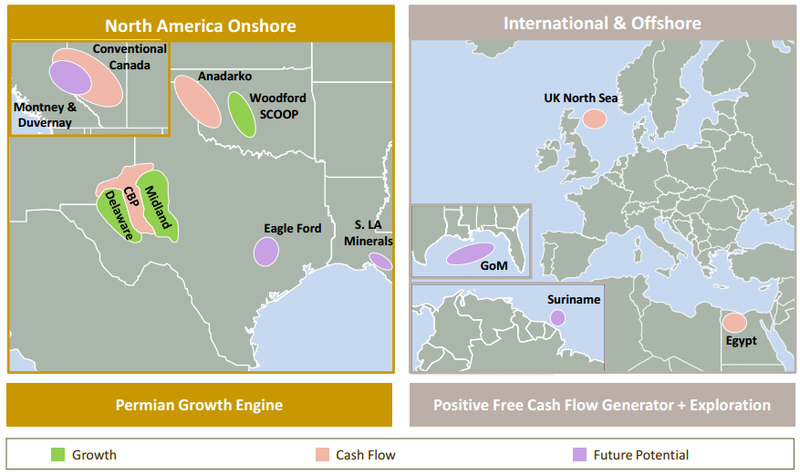 EOG resources is an oil and gas company with operations all over the U.S., and internationally in Canada, China, Trinidad, and the UK’s North Sea. Remember when I said the best companies have the best positions? 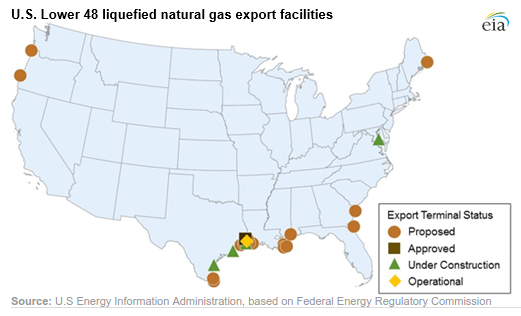 EOG operates not only in the natural gas-heavy Marcellus shale, but also in the Permian and Eagle Ford plays, putting it in direct reach of the U.S.’s main LNG hubs. Even though more than half of the company’s production is weighted towards oil, as of 2015 44% of its production came from natural gas and natural gas liquids (NGLs). Despite its placement in the Marcellus shale play, its biggest source of natural gas supply comes from the Leonard and Wolfcamp formations of the Permian basin. Each produces 69% and 74% gas and NGLs respectively. In addition to international reach and historically strong natural gas supplies, EOG offers investors a reliable dividend payout. Since 2010, the company’s dividend has more than doubled to $0.67 per share, and it's still growing! Apache Corp. is another company with international reach. It has operations in both Canada and the U.S., plus Egypt and the UK’s North Sea. 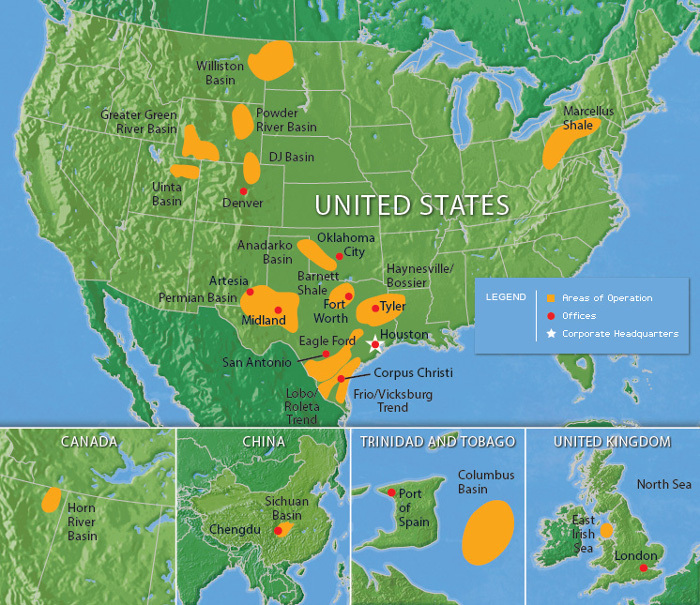 Within the U.S., the company operates in some of the most productive shale plays in the country, including the Anadarko and Permian basins, the Eagle Ford shale play, and the Gulf of Mexico. In late 2016, Apache announced the discovery of a massive oil and gas field in Texas in the southern section of the Delaware Basin. The company has named the play the Alpine High. Part of the formation reaches into the Barnett shale play, where the U.S. shale boom got its start. According to Apache, Alpine High has an estimated 75 trillion cubic feet of natural gas reserves, plus 3 billion barrels of oil. The discovery has opened up anywhere from 2,000 to more than 3,000 new drilling locations, and the company had already begun operating four rigs on the acreage as of January 2017. First gas from the area is expected in mid-2017. Here, you can see where Apache is currently producing, the areas that are getting the most development moving forward, and a few places the company may be looking to develop later on as prices get better. Apache has been in a position to continue exploration since prices began inching back up in mid-2016. With the recovery going into full swing, that trend can continue. Range Resources is notably one of the largest producers in the Marcellus shale play. More than half the company’s total net acreage, about 615,000 acres, is located in Pennsylvania. The company holds another 220,000 acres in northern Louisiana, and 210,000 acres in Oklahoma. As a natural gas-only company, Range has some of the most focused assets on the market today. Between 2012 and 2016, Range sold the lot of its Permian basin assets, as well as a few other non-core areas in Pennsylvania and Virginia to focus on its most productive acreage. As of this year, the company is zeroing in on a large part on its core acreage in the Marcellus. 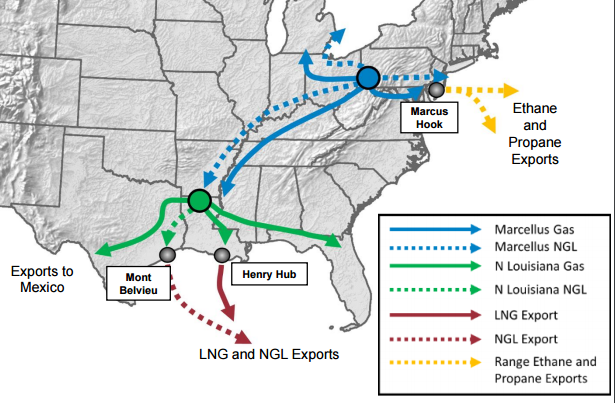 Its Louisiana assets are also in proximity to developing LNG export terminals at the southern tip of the state. Since 2014, the company has brought its operating costs down by nearly 54%, which makes it a stellar example of a company reacting strongly to the years-long price rout. As natural gas prices rise, Range’s core positions and increasingly affordable operations will give it a leg up on the competition, and offer investors more value for every dollar.